The belief which many of us held in the past that Masonry, as we know it, exists and has existed for centuries in China, is not home out by the facts. Careful students of the subject in China are convinced that while there are secret societies in China which bear some accidental resemblance to our Craft, they have no historic connection with Masonry. These societies have their words, signs, and tokens; some of them are religious and moral in their foundation, some are largely political in their objects, others are a banding together of men and sometimes women for no good purposes. The life of the Chinese, however, is shot through will) the same teachings and ideals as those that we hold. More than 2,000 years ago Mencius wrote that except as we use squares and compasses we cannot form rectangular figures and circles, meaning liy this, that there cannot be righteousness of life and self-control except in accordance with the teachings of these useful instruments. The common expression in everyday life for regularity and righteousness of conduct is Kueichu, "Square-Compass." The Chinese are a people whose sweet reasonableness reminds one of the ideals of Masonry. During the revolution in 1911 a group in Wuchang tried to exterminate the Manchus. The latter in fear attempted to conceal their identity by wearing Chinese clothes and thus escape. Their pronunciation of certain words, however, is different from that of the Chinese, who immediately applied the shibboleth test to them, and those whose speech betrayed them lost their lives. This butchery, however, was soon stopped by wiser heads and better hearts. Historic Masonry as we know it, however, has already made a good start in China. There are now three District Grand Lodges in China. Two of these are District Grand Lodges of the Grand Lodge of England; one is located at Hong Kong, and the other at Shanghai, and each has under it a goodly number of Blue Lodges. The third is the District Grand Lodge of the Grand Lodge of Massachusetts, which meets in Shanghai. This District Grand Lodge has under it three Blue Lodges in Shanghai, one in Peking, and one in Dairen. There are besides this in Shanghai two Scottish Blue Lodges, and until recently there was also a German Lodge. American Masonry was introduced into China by the captains of clipper ships, who came out from New England to trade with the Chinese. They naturally applied to the Mother Grand Lodge in America, in the jurisdiction in which they lived and worked, and secured charters from Massachusetts. One also finds Royal Arch Chapters, both British and American, and in Shanghai and in Peking there are Scottish Rite bodies holding charters from the Supreme Counsel for the Southern Jurisdiction whose see is in Washington. Most of the members of these Masonic organizations of all jurisdictions have been Americans and Europeans. There have been a few Chinese made Masons in China, and a few made in America and Europe who have returned to China. 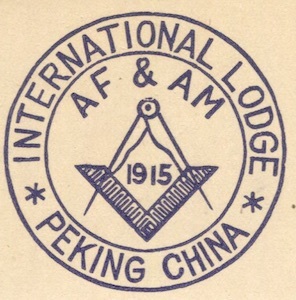 In the ease of International Lodge in Peking and the Scottish Rite bodies in that city, however, Chinese Masons were among the Charter members. They now have Chinese Cast Masters and a number of the membership are Chinese. Experience has shown that Chinese Brethren are excellent in exemplification of the degrees, and they are faithful in practising out of the Lodge those virtues which arc inculcated within it. The Peking bodies include in their membership several cabinet officers, judges of the Supreme Court, university professors, and other professional men. members of the National Senate, and leaders in every department of life. Three of the Chinese .Masons in Peking were in Versailles representing China in the peace conference. The Chinese race comprising, as it does, at least one-fifth of the population of the world, is the greatest field for the expansion of Masonry. The Masons in Peking have met with unusual favor on the part of the highest officials of China; the President presented for hunting in the Temple a handsome silk scroll with a motto from the Confucian classics written in his own hand. The bodies in Shanghai and Peking have taken a large part in the founding and fostering of schools. They have done their share in combating the opium and morphine evil, and have contributed as organizations and individuals for the relief of the famine sufferers of North China. In order to meet the last; mentioned need, they seni a special appeal through Dr. John R. Hykes, 33rd degree honorary, to the Sovereign Grand Commander, Bro. George F. Moore, which resulted in the Sovereign Grand Commander telegraphing to Peking a contribution of $40,000, which is probably the largest gift made by a Masonic organization to the relief of non-Masons. A visit to International Lodge, Peking, China, is described in a letter received from Ernest S. Rice of Chicago, who is making a tour of the world. International Lodge is operating under a warrant issued by the Grand Lodge of Massachusetts. "A large banner was hanging in the lodge room and it was presented to the lodge by the President of the Republic. Upon it was written the words 'by compasses and square our lives are circumscribed' and beneath was the signature of Shu Shili Chang. "By invitation I attended the meeting of International Lodge and witnessed the work in the second and third degrees, both of which were conferred on the same candidate on the same evening. The work began at 6 o'clock. We had dinner and later the third degree was conferred. The first third candidate was initiated in short form, several sacred books being used. "The working tools include a gauge. The Master presides, the Great Brother and Second Brother, compare with our Wardens, the First Point and Second Point, our S. D. and J. D.j and they have an Inner and Outer Guard. The degrees are the Affiliated Younger Brother. Obligated Elder Brother, and Obligated Uncle. "The first known lodge bore the name of the Royal Service Lodge, it being at Shanghai, the date of its warrant being Sept. 18, 1844. The Consistory charter is dated Oct. 2, 1902. Lodges under French constitution cannot visit English without taking special obligations. "Masonry here is a serious thing; they dress up in great style and a man is turned over and picked to pieces before he can join. Besides he must meet the social and business requirements of the members. "A number of Chinese belong to the University Lodge, its membership being confined to those who have university degrees. The United Service Lodge draws its members from employees in government service. "There are no thirty-third degree Masons in Hong Kong; there are a very few thirty second degree men, some who have the thirty-first and others the thirtieth. It is difficult to obtain many of the degrees of the Rite, and when they are given they are communicated. "I met Percy Smith, D. D. G. M., English Constitution, of Hong Kong and South China, and T. M. Black, D. G. M., Scottish Constitution of the same district, and visited the Zetland hall, where the Scottish and English bodies an-, for the first time, meeting in the same building." This page was last modified on 10 December 2015, at 15:48.